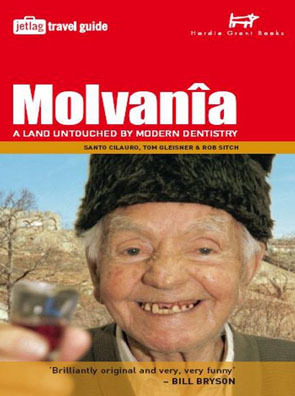 The Republic of Molvanîa, known as the birthplace of whooping cough and the Molvanîan Sneezing Hound, has been largely ignored by the backpacking set in its sweep through post-Communist Europe. This may have something to do with the country's miserable landscape, miserable weather, miserable food, and miserable, surly populace; on the other hand, it may have something to do with the fact that Molvanîa doesn't exist. In format and page layout, this inspired send-up of a travel guide looks exactly like the real thing, and it displays an acute feel for all the clichés of the genre, including testimonials that instruct how to have an uncomfortable "authentic" experience, rather than a "bland, westernized" one. The nation's new national anthem is set to the tune of "What a Feeling," from the movie "Flashdance" useful phrases include the Molvanîan for "Please," "Thank you," "May God send you a sturdy donkey," and "What is that smell?"